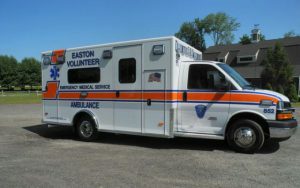 Easton EMS operates two similarly equipped Type III ambulances. 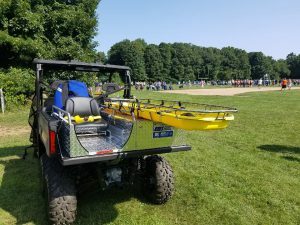 Each ambulance carries a wide variety of medical equipment, everything from Band-Aids to Automatic External Defibrillator (AED) and a Lucas device for cardiac arrests. 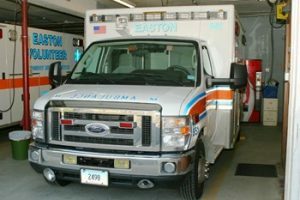 Easton EMS stocks oxygen, naloxone, epinephrine, aspirin, and glucose to treat common life threatening medical emergencies. Recently, in light of current events we have equipped out ambulances quick-clot and tourniquets to stop major bleeding. Additionally we carry backboards, combi-carrier scoop stretchers, and a stair chair to help get patients to the ambulance. Alongside standard personal protective equipment (PPE) like gloves and surgical masks both ambulances have reflective vests, extrication jackets, helmets, hazardous material suits and more to keep our crews safe. We have Stryker hydraulic stretchers, which makes loading and unloading safer for patients and providers. Both ambulances have red and white lights for emergency response and to make sure that we are seen on the side of the road. Both our ambulances are equipped with portable and mobile radios to communicate directly with Easton’s 911 center and CMED regional dispatch. Through these radios we can also communicate with Easton Police and Fire Departments as well as our mutual aid partners. Have Questions? Stop by and check out our ambulances in person! 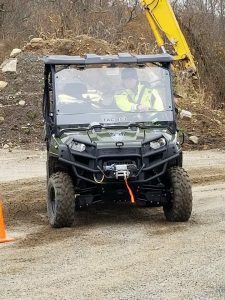 Our “tac 853” is a Polaris 6×6. Outfitted by Fleet auto supply. The entire unit was purchased and outfitted using donations. This unit will allow us to access numerous places in town where a full size ambulance just won’t fit. (It sounds like a helicopter landing for some reason…) thank you Easton for being so generous with your life saving, tax deductible donations!